Social skills are made up of interaction and communication with others. Social skills are put to use everyday. 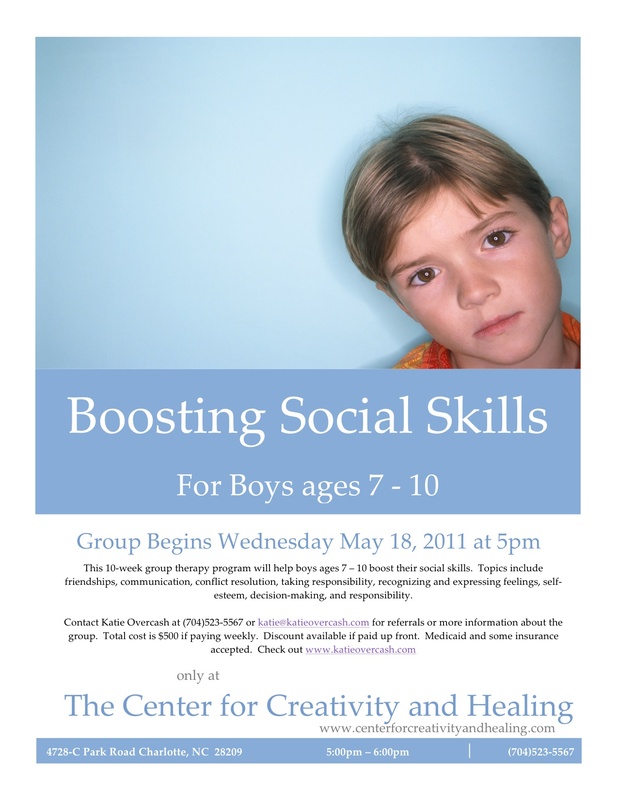 Boosting social skills for young boys is important at this stage of life because of their increased interactions with others, emergence of self-esteem and surge of social situations they are involved in. According to Erikson’s Stages of Development, boys in this stage are developing their self-esteem and proving to themselves they are capable of accomplishing new skills and knowledge. Participation in this group will foster those qualities by touching on topics such as; communication, conflict resolution, taking responsibility, expressing feelings, and more! Total cost for the group is $500. Payments can be split up each week or full payment before group is eligible for a discount. Ask about a referral discount too! Medicaid, NC HealthChoice, and some insurance accepted. Please contact for more information. This entry was posted in Uncategorized and tagged boys, communication, Conflict resolution, decision making, life skills, Mental health, recognizing emotions, self-esteem, Social skills on April 18, 2011 by katieovercash.